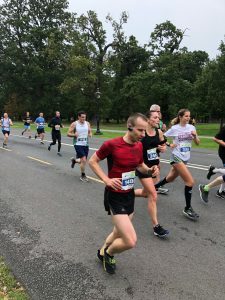 September 2018 Race Roundup - Civil Service Harriers A.C.
As we start to break out the hi-viz gear and head into winter training (the dreaded zoo loop!!! ), here’s a bit of a lookback at some of the achievements the club had on the roads in September. The month started off with the Lakes 10k out in Blessington. This had been touted as a flat course but some climbing in the second half of the race made it lot more challenging than people expected. Nevertheless there were some great performances from the club. Congratulations first of all to Brid Ryan who was third lady overall in a time of 43:15. Great running from Brid. Well done also to Gemma Treacy whose finishing time of 44:31 gave her a new PB over 10k. Some more great running from Amanda Treanor and Ashleigh Irvine who finished in 48:22 and 51:32 respectively. Thomas Geoghegan was first of our men home in 42:25, with Mark Carroll closely behind in 42:38. Next was Padraig Mac Carron (43:23), Maurice Kennelly (49:25) and Maurice McCartney (52:29). Great running lads. 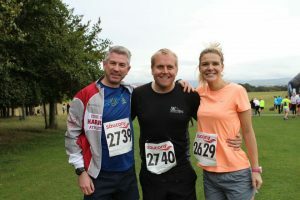 Club members didn’t have to go too far for this inaugural local charity race. Two laps of the Fifteen Acres – easy on paper, but that second lap always seems to go on forever. And I’ve never worked out why you always seem to be running into the wind, despite running in a circle…. There was a large turnout from the club. Seems people will do anything for a free breakfast. Might have to start bringing a few breakfast rolls down to training on Saturdays. There was silverware all round, including a double for our ladies with Emily Ennis and Ashleigh Irvine taking first and second spot. Great running girls! And it was a double celebration in the Ryan-Ennis household with Noel taking third place overall. Well done Noel! 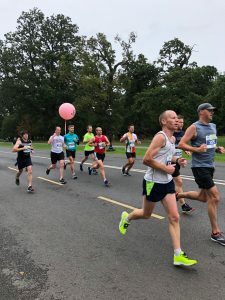 The Dublin Half Marathon was back in the familiar surrounds of the Phoenix Park. 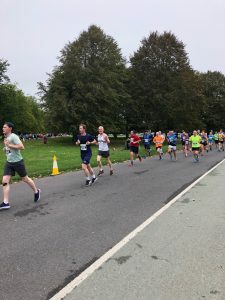 While most of the club was busy with marshalling duties we had a number of club members racing, with a big turnout in particular from the marathon group. It was a deceptively tricky course. After a fast start down the Glen road and Military road, the next few miles up Wellington road and the North road are a bit of a drag. There was also a last minute course change which brought runners up Whites road at mile 8. The climb here presented some challenges for runners, not to mention the marshalls! It was PBs gallore for the club. Brian Walls was first man home in a blistering 1:20:15 earning him a PB. 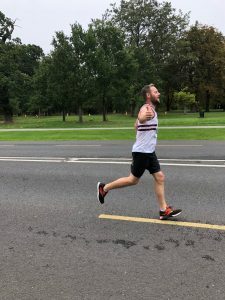 Ed Murphy got a massive PB finishing in 1:30:06. For a while we thought he was doing a three-legged race with the pacer. Ed was followed by Paul Foran in 1:33:01. 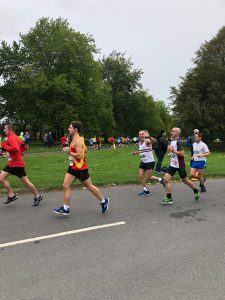 Niall Heylin, in his half marathon debut, and his first outing in club colours, finished in an impressive (but agonising!!) 1:35:01. Brian Boland was next home in 1:37:03 – another PB, followed by Marius Crisan in 1:38:54 and yes another PB. Tony Garvin overcame some recent illness to finish in 1:41:52. Alan Julian also got a PB with 1:42:06. Sunil Singh was next home in 1:45:19. Amazing running guys! Eleni Zacharogianni was first lady home in a PB time of 1:39:11. Next was Ann Foran in 1:39:23, followed by Maria Mellsopp in 1:44:19. 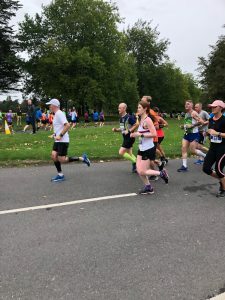 Sally-Ann Lynch also got a PB, finishing in 1:48:28. Marie Norris finished in 1:50:16 and an impressive 9th place in her age category. Next home was Mella O’Neill in 2:02:42. Some really great running from our ladies! 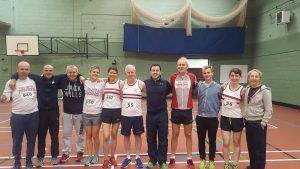 A large contingent from the club made the trek southside for the Rathfarnham 5k. 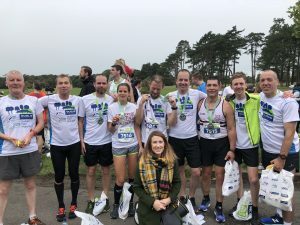 Some great running on the day with everyone finishing well under 25 minutes. 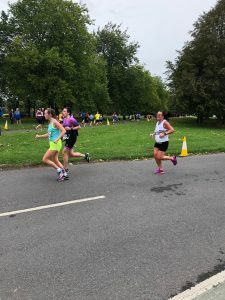 It was a case of another day, another PB for Gemma Treacy who was our first lady home finishing in 20:10. Great running from Gemma. Fiona Fagan wasn’t far behind in 21:29 and a PB I believe? Well done Fiona! Ashleigh Irvine was next in 23:33, followed by Emily Ennis in 24:11. Great running girls! Paul O’Neill was first man home in 17:14. Well done Paul! Congratulations to Sean Ryan who was first in his age category, finishing in 18:14. Christy Smith was next in 19:50, just ahead of Nick Devery in 19:52. 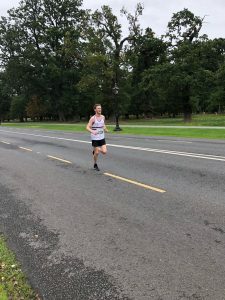 Maurice Kennelly earned himself a PB with a time of 21:24. Next was the other Maurice, Maurice McCartney, who finished in 23:53. Well done guys. Exciting month ahead as the marathon group heads into taper ahead of the big day and the rest of the club don their spikes for cross country. Happy training folks!